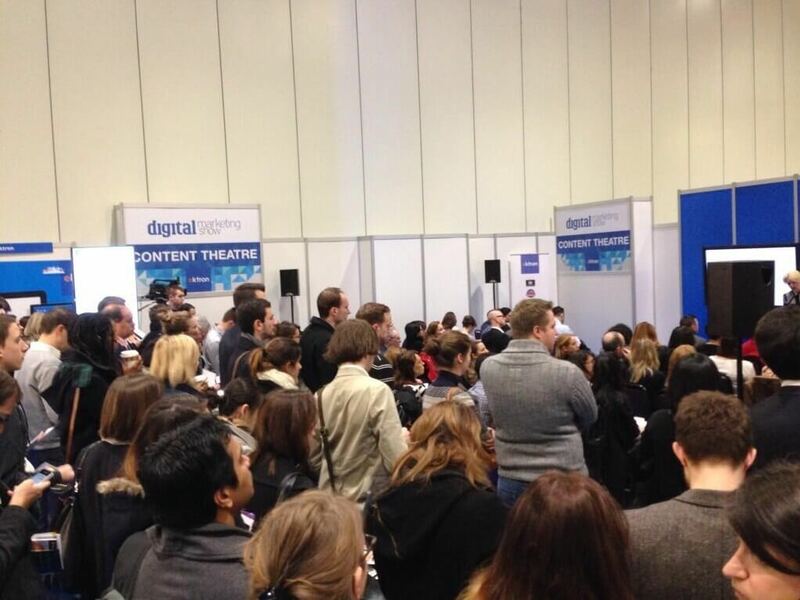 The Digital Marketing Show Mid-Term took place yesterday, as a one-day pop-up conference, in order to assist marketing professionals in keeping up with all of the latest Digital Marketing opportunities and trends. The B2B Marketing Lab was in attendance at the show, where speakers from Three, Google, Shutterstock and Microsoft (to name a few), discussed the hot topics within digital marketing of 2015 so far. We’ve pulled out our top three B2B takeaways from the day. We are all aware of #Mobilegeddon which took place last month and while some business owners may see mobile responsive website as just a cool feature to have, thanks to Google, it is now much more important than that. Did you know there are 75 million phone subscriptions in the UK? … and 70% of these are smartphones? Raja Saggi, Head of B2B Marketing at Google discussed how the average UK consumer spends two hours on a smartphone every day. But what does this mean for B2B organisations? The reality is that if half the people are using a mobile device to search, so you need to give them a good experience; otherwise they’ll simply go elsewhere – most likely to a competitor’s site that is mobile optimised. You must get into the mind-set of thinking mobile first. Is your site mobile responsive? Are you ensuring that all of your offerings are available on all devices? With 60% of buyer research done online, it’s essential that you provide the best possible experience to your customers regardless of the device they are using. Make things easy. Using the ‘Google Principles of Mobile Site Design’, ensure that your calls to actions are present, your menus are short and sweet and you streamline your form fields. Even with the average mobile screen size increasing with the iPhone 6 and Samsung S6, it’s critical to make it as easy as possible for the user. John Miller, Director of Digital Marketing at Shutterstock offered some great insight to the creative testing that takes place at Shutterstock. What image testing are you doing within your organisation? Are you testing which imagery works best? Which fonts work best? Or which colours work best? When making a decision on which image to use, the numbers don’t lie and they tell you which direction to go. There is also an importance of consistency when using images, John gave a fantastic quote of “There is no worse feeling than being lost on the web”, and while we can probably think of a couple of worse feelings out there (have you ever stepped on a plug?! ), this shows how important it is that you offer clarity through continuity. If one of your adverts includes an image of rainforest in, ensure that your landing page includes the same image, and ensure that your thank you page includes the same image. Using this simple continuity, Shutterstock improved their CTR by 36%. Which images should I use? John matched up some common image decisions that we make on a daily basis on which type of imagery produces the best CTR’s. Illustrations vs. photographs - Photographs win. Illustrations of humans vs. photographs of humans - Photographs of humans win. Is the use of imagery old news? Are they still the best type of design? Images lose; John provided some interesting facts into the use of motion imagery, and cinemagraphs, stating that the use of videos and motion outperformed images dramatically on the Shutterstock site. Our last takeaway looks at the use of email marketing, where a panel discussion took place between leading email marketers from Mailjet, Sign-Up.to and Silverpop. Continuing the theme of the day, the mobilisation of email marketing was the main discussion topic and how mobile is working with email marketing, rather than being a competitor. 50% of emails are opened on mobile devices and going back to the point raised by Raja Saggi from Google, you must get into the mind-set of ‘think mobile first’. Are you designing your emails to be opened on mobile devices? It’s important to understand that just because people are using mobiles over desktops, you can still get into the top of their inboxes using email best practices. The biggest single thing you can do is to increase personalisation. Are you using an email marketing platform which allows you to personalise your emails? If not then which past decade are you working in? You’re missing out massively if you’re not making your recipients feel valued through using the personal touch.